Digitizer alterations fall into two main categories: (1) simple and (2) more complex. Depending upon the type of work a digitizer plans to do, catalogers will need to alter different things in the container record. As a result, all requests for a status change should also include an explanation of what needs to be altered in the record. Contact a local Variations cataloger and request a status change to allow digitizer alteration. In detail, explain what needs to be altered and provide the record ID. Alterations may be made once catalogers notify digitizers of the record status change. Digitizers must inform Variations catalogers once alterations have been completed. When dealing with typos and errors in the original imported bibliographic record, also contact catalogers responsible for the corresponding media type to ensure that changes are made to the record in the online library catalog. If desired, include a detailed list of the issues in an email to the Variations cataloger, who will then forward all relevant information to the correct individual. Retain records of such requests, detailing ID, dates, original status, etc. When notified that alterations have been completed, create work records and instantiations for the newly added items. Be sure to bind all new instantiations. Once completed, change the status back to the original entry (if no time is available to create work and instantiation records for the new entries, mark the status as “Partially Bound”). In records, indicate the date the status was changed back and include any relevant notes. When notified that alterations have been completed, create work records and instantiations for any newly added items. Digitizers should not have access to the admin/cataloging tab or records. Student digitizers may only use the digitizer window and should never be able to access/edit cataloging records. If any tracks/pages are added or deleted, instantiations are impacted and catalogers will need to make adjustments (otherwise there are problems accessing the container). This process helps catalogers keep track of significant changes to records (there are some series in the library for which one bibliographic record exists, but only a few of the recordings have been digitized. If additional recordings in the series are digitized, catalogers need to know in order to create new instantiations for the newly digitized works). Basically, if anything is added to or removed from the container structure, catalogers need to know. Some of the normal operations in the digitizer window can destroy hours of cataloging effort. 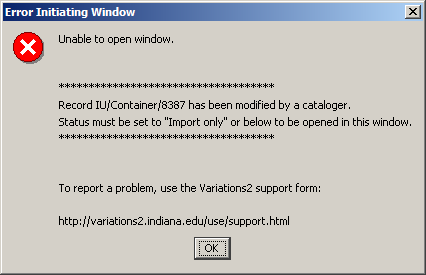 For example, importing a MARC record will overwrite any changes the cataloger may have made to the Container object. Replacing a WAV file can cause the Instantiations to be incorrectly bound (especially if there is measure-level binding).